A 26-year-old pregnant woman was bashed on the head from behind and mugged as she walked to the subway early Wednesday, and she tells NBC 4 New York she feels lucky to be alive. 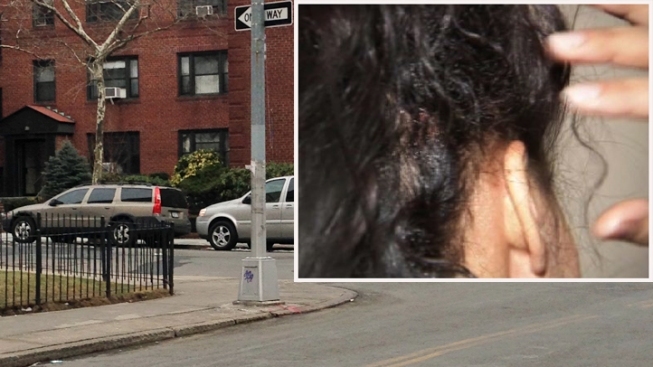 The woman, who is just over 5 feet tall and four months pregnant, was on her way to work at about 7 a.m. in Briarwood, Queens when the suspect came up behind her and hit her in the head. "I thought it was a hammer," she told NBC 4 New York in an exclusive interview. "I get cracked in the back of my head and fall down to my knees." The victim says the suspect was wearing a black jacket and hoodie. She says she handed him her handbag and told him to take it. It had her wallet, phone and MetroCard inside. "He grabbed the bag and ran in one direction, I got up and ran in the opposite direction, screaming at the top of my lungs," she said. Investigators found clothing nearby that may belong to the suspect. No arrests have been made. The victim was taken to the hospital with cuts on the back of her head. She said the pain wraps around her head and she has difficulty moving it. But she said she feels "blessed to be alive right now." She said she feels like her mugger just needs help. "He really needs it if he needs to attack people like this and steal from them," she said.